Having watched quite a number of sports movies over the years the general theme is that of an underdog overcoming tremendous obstacles (always against an arrogant champion) to win the grand prize at the last second. "Crooked Arrows" follows that pattern. Sports movies are full of cliches, ordinary acting, but also exciting action and "Crooked Arrows" was not much different. Originally I reserved it at the library, but saw so many negative reviews I cancelled it. I recently spotted it on shelf when looking for a time filler. Glad, as it brought back some memories. The special features were as interesting as the movie. I never played lacrosse, but for a few years I followed it very closely. I always fancied myself an appreciator of native culture and the special features reminded me of that connection. The Oshawa Green Gaels came to town when I was in high school and very involved with track and basketball. I didn't know how unique they were for a few years, but their excitement registered strongly with me. They believed in the importance of fitness that allowed them to execute a fast break style like the Boston Celtics. One of my favourite players was John Davis who was a phenomenal scorer. As years went by some of my school mates joined, such as Charlie Marlowe, Joe Krasnjy and Larry Lloyd. A particular favorite was Gaylord Powless and years later I met a sister and brother at a party hosted by my friends Bob and Adrianne Stone. Bob had joined me in watching many of the games. In another blog I told the story of hitch-hiking (http://www.therealjohndavidson.com/2012/02/hitch-hiking-memories.html) and looking for a place to stay overnight near Huntsville. Picked up by one fellow I rambled on about some of my interests and it turned out he was a Green Gael who played on a few of their championship teams. He told me this very casually, but more importantly found a cheap place for me to spend the night in his home town of Dwight. A prime reason for their success was Jim Bishop who was an advocate for fitness. He recruited players who could execute his fast break strategy. Eventually he went on to be involved with the Detroit Red Wings of the NHL and also to help start a pro lacrosse league. His team, the Green Gaels won the Minto Cup, the Junior lacrosse championship for Canada 7 times and had been voted Canada's top amateur team a few times. The Green Gaels eventually became boring, not because they lost any skill, but because they won so games often by lopsided scores that there was little dramatic tension in most of their games. There was still excitement at how they could work a fast break and the skills of all the players. After a few years of watching the Junior Green Gaels I watched the senior Brooklin Redmen and saw what most people see about lacrosse. Although demanding a high level of skill it can be rougher than hockey. These games tended to be lower scoring, but in some ways just as exciting. I moved and went to university and got away from lacrosse except reading newspaper reports. After a few job changes I found myself working for the Etobicoke Guardian in the circulation department. One of the teams they covered was the Etobicoke Eclipse, a lacrosse team and I saw a chance to use one of their games in a sales contest. At the time I was writing a newsletter and had developed a crossword puzzle that encouraged my carriers to find the answers in the newspaper and also the newsletter itself. I got the sports reporter, Howard Berger to agree to put one of the answers in his column. At the game I had arranged to have a photo to be taken with one of the top players and a contest winner. The Eclipse chosen was Adam Oates who went onto to be a prominent hockey player for the Boston Bruins. Part of the Oshawa Green Gaels' success came from the involvement of Gaylord Powless who learned his lacrosse in Oshweken, a Mohawk reservation near Brantford. Gaylord was honoured as Canadian Indian athlete of the year at least once. In "Crooked Arrows" the main tribe associated with lacrosse was Onadaga in upstate New York, another branch of the Six Nations. I became aware they consider themselves a sovereign nation and lacrosse was a sacred game. The movie showed a concept of lacrosse having almost a religious meaning for the players. 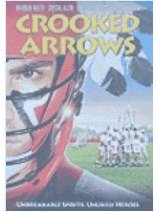 "Crooked Arrows"would be enjoyable if you either like lacrosse or would like to understand native American culture (really both sides of Canadian/American border). For me it was personal.